Pois bem, haviámos comentado em sala sobre o trabalho de Powner et al. (2009) sobre a síntese de pirimidinas. Powner MW, Gerland B, Sutherland JD. School of Chemistry, The University of Manchester, Oxford Road, Manchester M13 9PL, UK. · Nature. 2009 May 14;459(7244):171-2. Quentinho do forno da ciência, o grupo investe na avaliação da síntese de purinas em condições plausíveis para a era pré-biótica em um artigo recém publicado! J Am Chem Soc. 2010 Nov 24;132(46):16677-88. Epub 2010 Nov 2. Powner MW, Sutherland JD, Szostak JW. Howard Hughes Medical Institute and Department of Molecular Biology and Center for Computational and Integrative Biology, Massachusetts General Hospital, 185 Cambridge Street, Boston, Massachusetts 02114, United States, and MRC Laboratory of Molecular Biology, Hills Road, Cambridge, CB2 OQH United Kingdom. 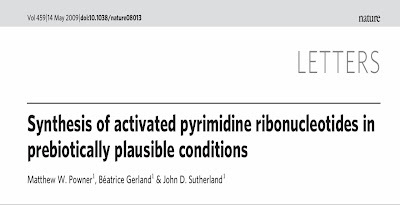 The recent development of a sequential, high-yielding route to activated pyrimidine nucleotides, under conditions thought to be prebiotic, is an encouraging step toward the greater goal of a plausible prebiotic pathway to RNA and the potential for an RNA world. 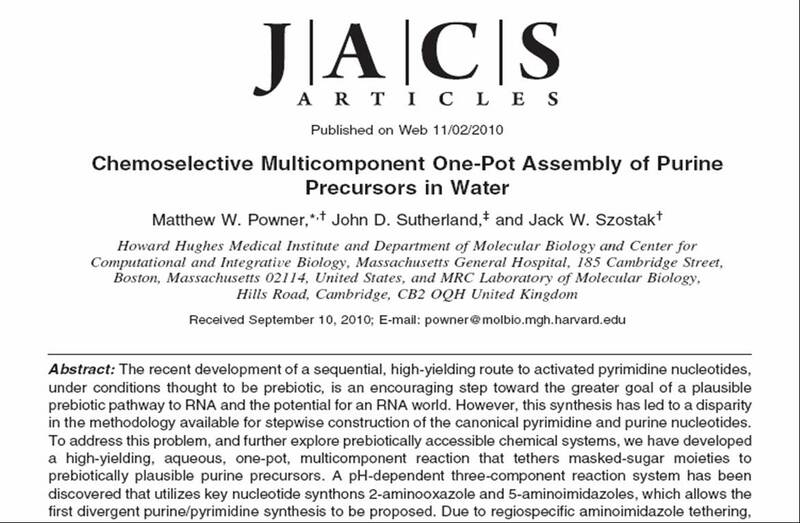 However, this synthesis has led to a disparity in the methodology available for stepwise construction of the canonical pyrimidine and purine nucleotides. 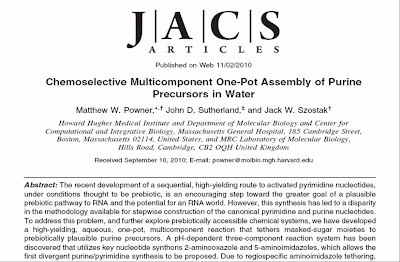 To address this problem, and further explore prebiotically accessible chemical systems, we have developed a high-yielding, aqueous, one-pot, multicomponent reaction that tethers masked-sugar moieties to prebiotically plausible purine precursors. A pH-dependent three-component reaction system has been discovered that utilizes key nucleotide synthons 2-aminooxazole and 5-aminoimidazoles, which allows the first divergent purine/pyrimidine synthesis to be proposed. 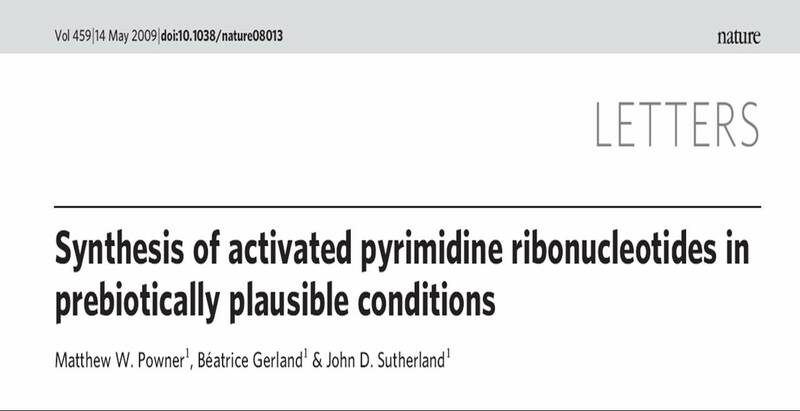 Due to regiospecific aminoimidazole tethering, the pathway allows N9 purination only, thus suggesting the first prebiotically plausible mechanism for regiospecific N9 purination.